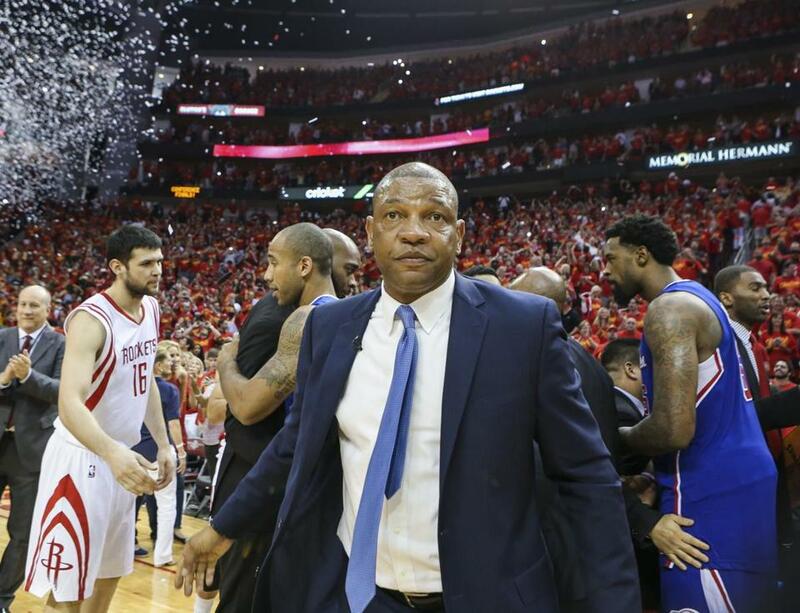 Los Angeles Clippers head coach Doc Rivers walks off the court after game seven of the second round of the NBA Playoffs against the Houston Rockets at Toyota Center. The Rockets defeated the Clippers 113-100 to win the series 4-3. Clippers coach Doc Rivers has spent much of the past few weeks — since his team squandered a 3-1 Western Conference semifinals series lead to the Rockets — with his mother Betty, who has been in poor health. It’s been a difficult time because Rivers is reflecting on many things, regretting that the Clippers regressed so suddenly after three dominant performances, while engrossed in wonderful memories of his mother. Rivers believes his team should have ended up clashing against the Warriors in the Western Conference finals. But Rivers’s brother, also visiting their mother, offered a reminder of an old family philosophy. The question Rivers has to ponder in the offseason is how to get the Clippers to the next level, a responsibility he embraced when he left the Celtics in 2013. In a matter of a few days, the Clippers went from the darlings of Los Angeles to the reputation of a choker, and Rivers has to swallow that — at least until next season. Performance of Doc Rivers's three teams in 16 seasons as a head coach. “We had a great shot at it, we just let go of the rope at the wrong time,” he said of blowing the series against Houston. “Listen, you’ve got to give credit to the team that did it, they made shots. They supplied the pressure and we didn’t respond very well, bottom line, as a whole group. As tough as it is to swallow, I live with this group and we’ve been together for two years and some would even say one [year] because of last year with all the crap [with previous owner Donald Sterling]. You could make a case this was our first real run through it. Rivers’s top two players — Chris Paul and Blake Griffin — received the most criticism after the defeat. And Rivers received his fair share. He is also the team’s president of basketball operations, responsible for some of the roster moves, such as signing little-used Spencer Hawes to a four-year deal and trading Jared Dudley and a first-round pick to the Bucks for little in return. And because of a lack of support, Paul again missed out on the chance for his first Western Conference finals in 10 seasons. “I feel bad when Chris or Blake get undue criticism,” Rivers said. “Blake got the most, obviously, by his play and all that. You know what people forgot is Blake was the best player in the playoffs for the first round and maybe the best player in the playoffs for the first five games. Rivers has to find creative ways to upgrade a roster he believed was ready for a long playoff run when the season began. But depth was an issue and the Clippers were a flawed team. There has been speculation of a reunion between Rivers and former Celtic Paul Pierce. Pierce, who played last season with the Wizards, has a player option for next season. If he opts out, he could sign with the Clippers, though cap space would be an issue. The Clippers would jump at the opportunity to bring in Pierce, an Inglewood, Calif., native, but there will be competition. Meanwhile, Rivers’s son, Austin, experienced a revival in his stint with the Clippers and is an unrestricted free agent this summer. Rivers cannot discuss his son’s free agency. He was only able to comment on his impact this season. It’s been a difficult few weeks for Rivers. His coaching reputation has taken a hit and the pressure will be on him and the team to respond next season. Only reaching the playoffs is no longer acceptable. With an owner who invested $2 billion to purchase the team, expectations have risen. The Clippers in the last five years. Rivers took over for the 2013-14 season. “I love this challenge. As strange as it sounds, I thought a couple of those bad years in Boston where we were trying to add players and we finally did it [helped me],” Rivers said. “I love those years because you’re building and then when you’ve finally got it, you’re built toward a championship and try to win another one, so this is a great stretch. NBA Commissioner Adam Silver spoke to the media during a press conference before the start of the first game of this year’s NBA Finals. 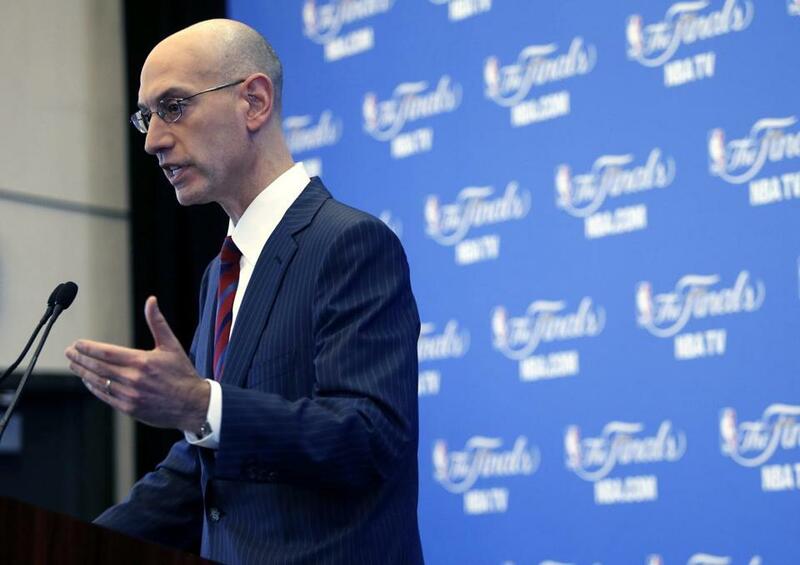 The health of the NBA is pristine, according to commissioner Adam Silver. The most common complaints would involve minor tweaks that could perhaps improve the game. There is nothing major. An adjustment to the playoff system? A tweak to the draft lottery? Preventing the hack-a-bad free throw shooter strategy? All relatively minor issues that will not prevent the league from continuing to soar with a $24 billion television contract set to begin in 2016. Silver weighed in on a number of issues, including the increase of serious injuries to players. “There are more high-profile players seemingly that are injured this year than last year. So that always concerns me,” Silver said. “I think it’s something that the league and the teams are spending enormous resources on for best-of-kind medical care, best-of-kind science, to see what we can do to prolong players’ careers and keep them on the floor longer. Silver has a major challenge ahead to avoid sets of consecutive games without beginning the schedule earlier — which would conflict with the major league baseball playoffs — or extend the schedule, which would spill into July and compete with the heart of baseball season and NFL training camps. “From our standpoint in terms of scheduling, something I’ve talked about, we’ve revamped the entire scheduling process this year to try to do everything to clear more windows at our arenas, to clear more broadcast windows,” Silver said. “ESPN and ABC and TNT have been very cooperative in releasing sort of Thursday night and Sunday afternoons, releasing their exclusivities to allow us to schedule other games in those time slots. Those things make a difference. In March, NBA Players Association executive director Michele Roberts said she would prefer — and it was a possibility — for the union and the league to agree to a new CBA before the union opts out in 2017. Silver agreed, lending credence to the theory that there is newfound harmony among the two groups. Perhaps offering ammunition to the union after the owners had claimed poverty before the last CBA, Silver gushed about the overall health of the league. Silver didn’t offer hope that the NBA would seed playoff teams regardless of conference affiliation. For example, if the league seeded teams merely by record, the Celtics would have played the Warriors in the first round, making for a logistical nightmare. 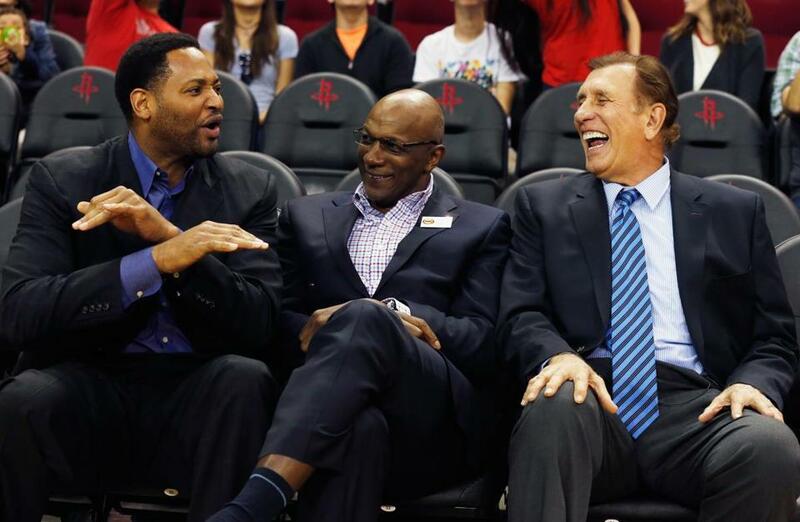 Fomer Houston Rockets Robert Horry (left) and Clyde Drexler shared a laugh with former coach Rudy Tomjanovich as the team honored the 20th anniversary of back-to-back championships last March. Robert Horry is an NBA originator. He is one of the primary reasons why teams in the past 20 years began adding outside shooters for playoff stretch runs. Horry, with his 3-point prowess and ability to hit game-changing shots, was a critical part of seven NBA title teams over his 16-year career with the Rockets, Suns, Lakers, and Spurs. 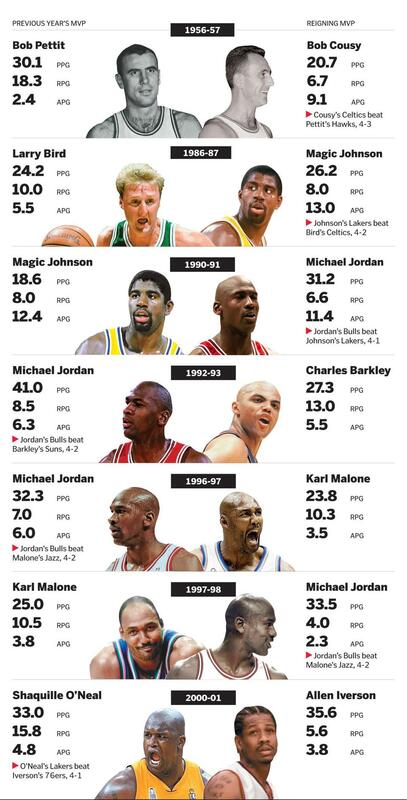 What’s more, Horry’s seven championships is the most of any NBA player not a Celtic. Horry is considered one of the league’s ultimate winners and played a pivotal part in all of his seven titles, which begs the question, is he a Hall of Famer? “The crazy thing about the Hall of Fame is if you look at the history of basketball, there’s a lot of guys with less stats than me,” he said. “If I don’t get in, fine. If I get in, fine. Half the guys in the Hall haven’t accomplished half the things I have, so I’m not worried about that. Robert Horry's production in the regular season vs. the playoffs. Horry made a career out of big shots during the postseason. He averaged just 7 points per game during his NBA career and 7.9 during the playoffs, but the timing of his shots was uncanny, catapulting him to revered status for his clutch play. Former Houston coach Rudy Tomjanovich, speaking about his players on the Rockets’ back-to-back title teams in 1994 and ’95, endorses Horry for the Hall of Fame. The only remaining coaching opening is in Denver, and it’s uncertain in what direction the organization is headed. The Nuggets have interviewed former Lakers and Knicks coach Mike D’Antoni, ex-Kings coach Mike Malone, and Wizards assistant Don Newman. They could also bring in ex-Knicks and Hawks coach Mike Woodson. There appears to be no clear-cut candidate for the Nuggets as interim coach Melvin Hunt remains in the mix. Denver could be an intriguing job considering the Nuggets have the seventh pick in the draft and also a solid core returning with Kenneth Faried and Ty Lawson, although both have had their issues with the organization . . . Commissioner AdamSilver said he planned on visiting the new arena site for the Warriors in the Mission Bay district of San Francisco, which is scheduled to open for the 2018-19 season. Again, it appears that a refurbished NBA arena has run its course less than 20 years after a redesign. Oracle Arena was gutted and rebuilt, moving the Warriors to the San Jose Arena for the 1996-97 season, but Silver reiterated during his media session Thursday that the Warriors “need a new arena” and lamented Oracle’s facilities. The NBA was relegated to holding Silver’s news conference in a room usually reserved for batting cages for the Oakland A’s. Silver said he has no issue with the team moving to San Francisco. In fact, the hotel for NBA employees and the media for Golden State’s portion of the Finals is located in San Francisco . . . The Pacers have indicated to draft prospects that they want to play a more up-tempo style, moving Paul George to power forward. They are looking for a more athletic center in the draft or free agency, potentially to replace Roy Hibbert, who has a player option on his contract for $15.5 million. Of course, the Pacers also would like to reduce the role of David West, who has a $12.6 million option. Indiana has a large group of free agents: Lavoy Allen, C.J. Watson, Luis Scola, Donald Sloan, Rodney Stuckey, and Chris Copeland. So look for the Pacers to undergo a major retooling this summer . . . A darkhorse location for Rajon Rondo in free agency is Sacramento, where the Kings are entering a pivotal year in their franchise and could use a bona fide point guard. Darren Collison, coming off hip surgery, is the team’s scheduled starter for next season. Rondo, who didn’t appear interested in going to the Kings a few years ago, could use the club as a springboard to perhaps a larger contract if he signs a one-year deal. Rondo is also close friends with Kings forward Rudy Gay. This NBA Finals marks the eighth time the reigning MVP (Stephen Curry) has faced the previous (Lebron James) for the championship. Gary Washburn can be reached at gwashburn@globe.com. Follow him on Twitter @gwashburnGlobe. Material from interviews, wire services, other beat writers, and league and team sources was used in this report.